After blogging every day in my NYC Diary, it was nice to take a break from posting and just spend some time with my loved ones whom I missed dearly while I was away. Now I am back to my once a week blogging schedule and it looks like I am a bit blue...well, more like VERY blue! Why? 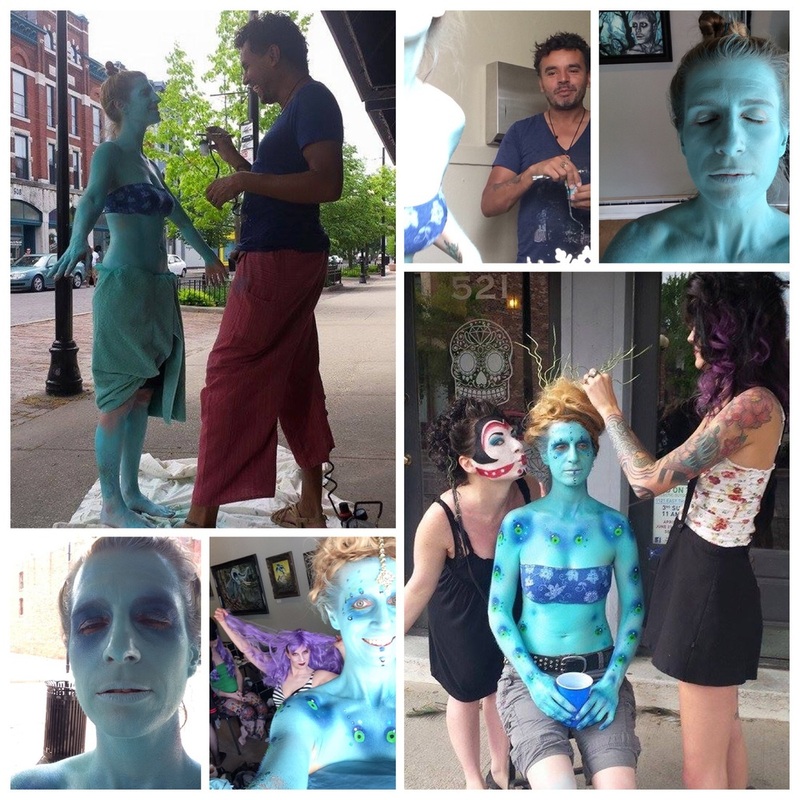 My friend, Mary, owner of Clash Dayton, organized an Alice in Wonderland themed photoshoot for their June festivities and I had the honor of being the caterpillar! This was the first collaboration with the very talented Robert Walker, but look for more to emerge in the near future! He started by airbrushing most of my body and then used various stencils and tools for the details. Many thanks to Hayden, whom you may recognize from this painting, for encouraging my hair to do something other than lay there! The total experience took about eight hours and involved several models. It was a fanciful day that left me with just one question, Will it come off?!? The answer, Yes! With a lot of hot water and scrubbing! Interested in seeing the final photos or perhaps to purchase some of the lovely threads shown? Join us Friday, June 5th from 5-10pm for First Friday at Clash Dayton, located at 521 East Fifth Street, Dayton, OH! I will have several of my Wasp in a Wig paintings on display and some special offers on Alice related items!